Don't miss to watch 17th Asianet Film awards 2015 telecast today and tomorrow (24 &25) part 1 and part 2 full streaming online on websites which stream Asianet. Asianet Film Awards 2015 dance, skit, singing performances will be aired in two parts on Saturday, 24 January and Sunday, 25 January at 7 pm. Celebrities from the South Indian film industry performed at the live event which was witnessed by a crowd of about 20,000. Television spectators around the world would be getting hours of entertainment as their favourite film stars deliver their majestic performances before a thick packed audience of about 20,000. The 17th edition of Asianet Film Awards ceremony will be a show of dance and music creamed with fun and humour. Instituted to honour both artistic and technical excellence in the Malayalam language film industry, this award function has gained in popularity over the years. It is currently one of the most-watched award ceremonies in Kerala television. The event was held at Willington Island, Kochi on 11th January 2015. Ujala is the branding sponsor, which the event has been powered by Nirapara and co-presented by Swarnam Nalleanna and Muthoot Mini. The co-sponsors of the show include Henko, Exo, Maxo, Bhima Jewellers, Joy Alukkas, Josco Jewellers and Libero. Actor Mohanlal was facilitated by Mammooty and Asianet managing director K Madahan. Mukesh was honoured for his 33 years of contribution in the malayalam film industry. 'Iyobinte Pusthakam' directed by Amal Neerad won the award for the best film while Anjali Menon won the award for the best director for the movie 'Bangalore Days'. Mammootty won the best actor award for his role in 'Varsham' and Manju Warrier won the best female actress for the film 'How old are you'. Biju Menon and Nazriya Nazim managed to win the popular actor's award. 'The best popular film award was given to 'Bangalore Days'. The other award winners include - Jayasurya (Best actor in negative role), Haricharan (best male singer), Swetha Mohan (best female singer), Asha Sarath (best character artiste-female), Anoop Menon (best character artiste-male), Suraj Venjaramoodu (best actor in a comic role) and Vineeth Sreenivasan-Namitha Pramod (best star couple). Awards were also handed out to Rafeeq Ahammed (lyricist), Gopi Sundar (music director), Amritha Anil (child artiste), Gopan Chithambaram (script writer), Amal Neerad (cameraman), debut artistes Farhan Fazil and Nikki Galrani, Parvathy (best supporting actress), Tini Tom (best supporting actor), Beena Paul (best editor), Fahad Fazil (performer of the year), Dulquer Salman (star of the year), Youth Icon (Kunchacko Boban), Jayaram (Asianet Golden Star award), Lal and director Venu (special jury awards). The gala function which include dance, singing and comedy skits featuring celebrated actors from South Indian film industry will purely deliver a visual delight for the spectators. 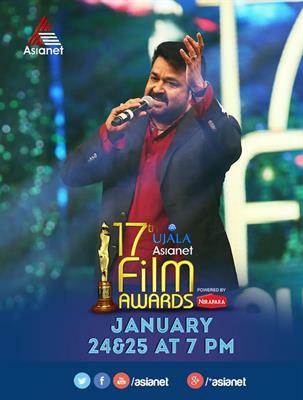 The 17th Asianet Film awards event will be telecasting on 24th &25th January 2015 at 7 PM. So tune into Asianet and enjoy the magical treat offered by the stars on earth.